Frustrated with undesirable formatting when pasting text from a webpage, e-mail or document? FormatMatch is the answer! 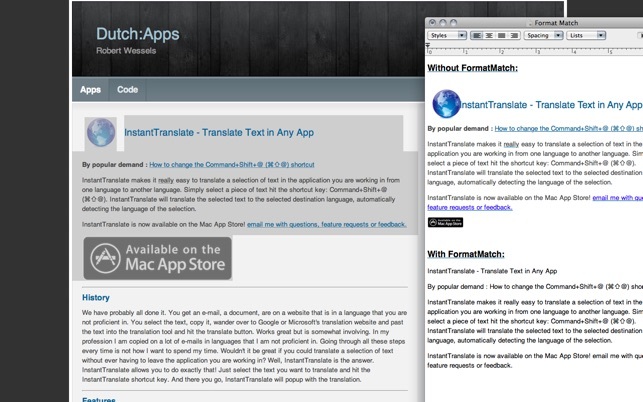 FormatMatch removes all formatting such as tables, images and matches the formatting of the application you are currently working in when pasting the copied text. FormatMatch can start at login. To enable start at login, open the preferences and check "Start at Login" (disabled by default). The next time you login, FormatMatch will automatically start ready to use! FormatMatch can be activated and deactivated using a shortcut key (disabled by default). The keyboard shortcut allows you to activate / deactivate FormatMatch without having to take your hands of the keyboard. To enable the shortcut key, open the preferences, check "Enable shortcut key..." and press any key combination you desire to activate / deactivate FormatMatch. Note that any application using this shortcut key will no longer respond to the key combination. It is therefor recommended that you only use the CTRL key + any other key as your shortcut. - Preference to disable the menu bar icon. This is a terrific utility. I save most of my project(s) information in Evernote, and it was so time consuming to paste data into TextWrangler just to strip off the formatting. It was also, time consuming in Evernote to not be able to paste with a right-click of the mouse. 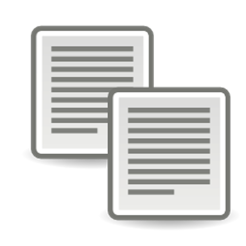 This app solves that by removing the formatting for all text when pasted into many applications. The developer acknowledges that it doesn't support all applications, and unfortunately, Apple's Numbers spreadsheet is not supported, but given all the use I get out of it, it's worth 5 stars and would be worth more than Free for me, too. Thanks to the developer for providing this handy utility at no charge. If like me you have suffered through endless re-formatting of text pasted into M$ Word, this app will save you. It make the default paste plain text, matching the formatting of the document you're pasting into. OK, there are ways to achieve this without installing this app--some complex combination of keys that will do the same thing. But even after years of misery, I have never managed to remember those key combinations. Plain text paste is what I want about 90% of the time, so it is much easier if command-v gives me that without my having to think about it. And if I want something else, I can just de-activate FormatMatch in the menu bar. As a software developer, I am frequently taking notes in Evernote and cutting and pasting content from Terminal or my IDE. It is extremely frustrating to have the black background of Terminal and the font and color come along for the ride, requiring me to fiddle with the font settings each time. Evernote added the “Make plain text” feature, which was helpful, but I still have to select my text and apply that feature. FormatMatch is perfect. The instant I launched it, the pain instantly disappeared. Things just work how I want them to now.